This click beetle in the family Elateridae was another night find. I’d like to say those light producing organs on the prothorax drew my attention. In reality, its “headlights” were “off” when I found it. 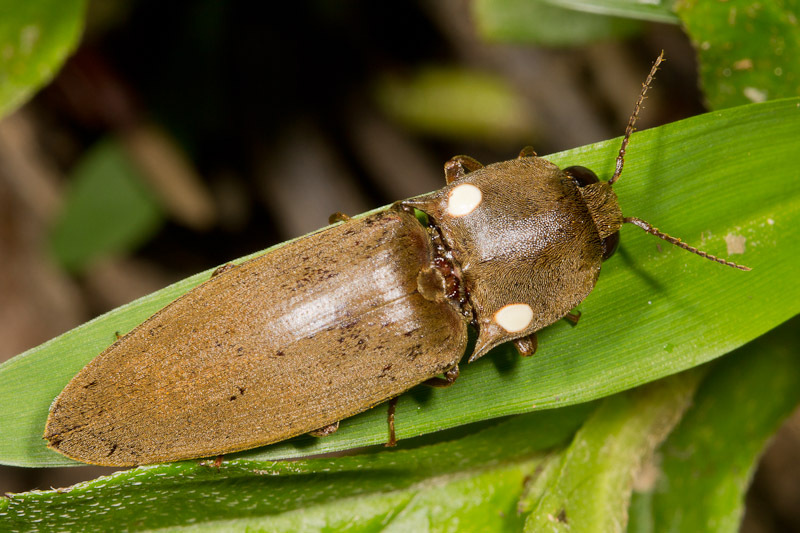 There are many species with these light producing organs spread across many genera, but they are all commonly referred to as headlight beetles. On a side note, my blacklight flashlight was kind of a bust otherwise I’m afraid to report. I had hoped to find some scorpions at least, but this beetle was the only thing it turned up. This entry was posted in Featured Photos. Bookmark the permalink. BCA has some illustrations of Pyrophorus in this group, but that taxonomy is likely not up-to-date. At any rate, very cool. Dont suppose you can you have these as pets can you? Good question, Ian. Maybe, and I’d bet researchers have kept and reared them. You’d really have to investigate their natural history though to figure out how to properly care for them.